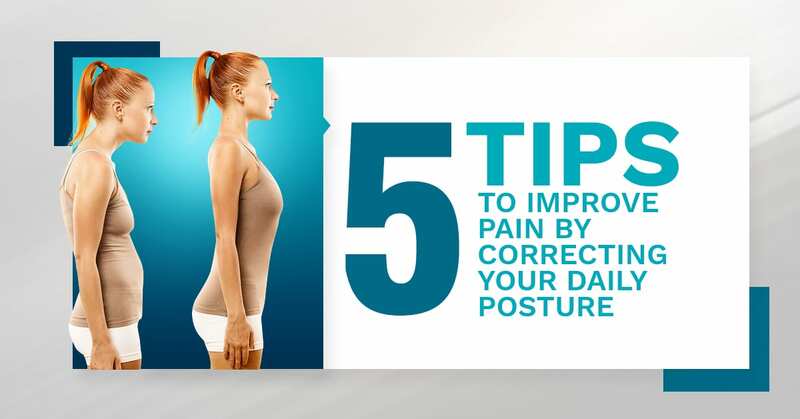 5 Tips to Improve Pain by Correcting Your Daily Posture - Piedmont Physical Medicine & Rehabilitation, P.A. When we were younger, many of us remember being reprimanded by our parents for slouching our shoulders as we sat or walked. We were often told to sit or stand up straight to improve our posture so we wouldn’t “wreck” our back or neck. The importance of proper posture is often downplayed, but having improper posture can have a significant impact on spinal health, which can lead to neck or back pain. At the top of the spine sits the neck and head. The neck is vulnerable to the damaging effects of poor posture, as it is not only influenced by the position of the skull but also the curvature of the spine. Leaning your head in front of your shoulders can place a considerable amount of pressure on the vertebrae. Malposition of the spine over long periods of time can also put a substantial strain on the neck muscles, causing them to become tense and tight. This tension often leads to stiffness. Muscles that are also susceptible to damage due to strain include the scalene muscles, suboccipital muscles and levator scapulae muscles. Forward head posture also places strain on the upper back and shoulder muscles, as they are constantly working to correct and balance the improper placement of the head. This excessive muscle strain is a common culprit for recurring neck and back pain. A good place to start is to understand your postural habits. How do you sit, walk or stand on a daily basis? Observe and compare your posture to others – do you recognize a difference? Stand in front of a mirror (from a side or profile view) to make notes about your natural stance and pinpoint what you can improve on. Or recognize the importance of breathing. Deep breathing exercises, allowing your lungs and diaphragm to fully expand, can help you improve your postural habits. If you recognize that you have poor posture while walking or standing, a few good things to keep in mind are the positions of your hands, shoulders and feet. Keeping your hands in your pockets inadvertently cause you to slouch, pulling your shoulders forward. While upright, your shoulders should be squared and straight with your feet aligned with them. Your posture can also be improved while you sleep. A good mattress (usually one that’s firm but not too hard) will support the spine and its natural curves. Your mattress should be able to keep your spine in the same body position good standing posture. Finding the right sleeping position can also help improve your posture. Sleeping on your back or side are generally good sleeping positions. Sleeping on your stomach is never a good idea. One trick for low back pain is to put the sole of one foot on the inside thigh of the opposite leg while you are on your back. A second is to push three tennis balls into the toe part of a sock and then tie a knot on the end of the sock so as to hold them tightly in place. Place the sock behind your head so that it gets in the way. The idea is that the tennis balls won’t let you wrench your neck backward while you are asleep. This works great for chronic headaches and neck pain sufferers. With this trick, it doesn’t matter if you sleep on your side or your back. You can also put the tennis balls on top of your pillow, below it, or even in your pillow case. For those who want to incorporate exercises to improve posture, focus on core strengthening routines. Target areas include the abdominal, low back, and hip muscles that connect your spine, pelvis, and legs. Core fitness programs such as Pilates can be excellent for improving posture; as long as excessive spinal extension is avoided. Yoga has a place in postural development as well. There are several other options: Systema Martial Arts, for example is excellent at improving core strength and posture. These regimens work the body’s entire core with slow and controlled movements. Even if structured exercise isn’t your forte, remember that it’s always important to keep moving. You never want to be sitting at a desk for too long without getting up to move around and stretch your body. Sitting too much can lead to poor posture and cause neck and back pain. If you’re sitting at a desk for hours on end, try to get up at least every 20 minutes to do a quick stretch. Implementing these tips into your daily routine will help gradually improve your posture. Establishing perfect posture won’t happen overnight, so it’s important to be consistently aware of how you sleep, sit, stand and walk. If you continue to have chronic neck or back pain, we are also here to help. We perform a thorough diagnosis and evaluation for each patient to help treat and manage the underlying cause of pain. Contact us at 864-235-1834.